This is how 9-year-old Krsasimir Lakov summed up how useful for him was the participation in the “Proud of my parents work” programme, facilitated by Bulgarian Network of the UN Global Compact. On October 28th and 31st as well as on November 1st , the Bulgarian business’ national initiative targeting the meaning of labour as a value, “Proud of my parents work” programme, took place in 19 companies among 9 cities across Bulgaria. For a fourth consecutive time the companies reveal the creative side of labour and present the real value of money and it being a measure of the contribution of each worker. The project has proved its contribution in helping the company employees realising the true value of their labour and in helping children’s early professional orientation through personal interaction with the company professionals. Numerous organisations took part in edition 2016 of the project: Asarel Medet, Aurubis Bulgaria, Investor media, Central Contour Global Maritsa East 3, Ideagen, Bulgaria On Air, Mobiltel, Neochim, Overgas, Ognyanovo-K, CIBANK, Solvay Sodi, Sopharma, Stomana Industry, TechnoLogica, Transpres, Chez Bulgaria, FESTO and SAP Bulgaria. For a consecutive year the children of Asarel Medet’s employees had the chance to visit their parents’ work place which created a happy and cheerful atmosphere during the entire day. The young guests managed to see the impressive exposition of the mining machinery that is no longer in use, after which they could learn more about Asarel’s modern dispatching system for automated control of technological processes in the mine. It was exciting for the children to visit the extraction and electrolysis installation for copper. The last stop of the tour around the premises was saved for the water treatment plants where the children learned more about the method of automated water quality monitoring. 60 of Mobiltel employees’ children, aged between 6 and 12, were welcomed at the telecom’s central in Sofia where they would learn more about their parents’ work. The little guests had the chance to hear more about the various professions of the company’s experts who work in the field of capacity building and technical service, the ones in the HR department, those working with customers, as well as the corporate communication and PR teams at the telecom. On October 31st 2016 Overgas took part in the fourth edition of the “Proud with my parents work” initiative. 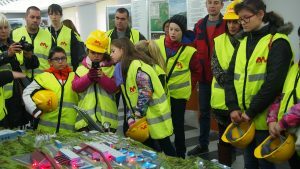 What is natural gas, what are its advantages, how is the gas network constructed and maintained, were some of the topics which the children between the age of 6 and 14 learned more during their visit at the company. With the help of the professionals at Overgas and with specially developed games, the children gained new knowledge about the professions of the ecologist, the designer, the geologist and the gas technician. At Sopharma, the initiative developed in several stages. First, on October 31st , 20 of the employee’s children entered the factory’s premises in Vrabevo so that they could hear more about the purpose of the medical drugs, to see how they are manufactured and what stands behind Sopharma’s production. On October 1st the initiative was organised for the children, who are proud of their parents’ work at Sopharma’s premises in Sofia. Now after their participation in the programme, mom and dad’s phrase “I am going to work” now has a different meaning for the lit tle ones. On October 31st as part of the initiative, TechnoLogica’s children took part in a lecture about labour and money and were taken into the exciting world of technology where they had a first hand experience with the professions of the consultant, merchant, programmer, engineer, GIS specialist and an accountant. During the day children took part in numerous games, learned how to use a 3D scanner and 3D printer, they disassembled and assembled a computer with the help of an engineer.